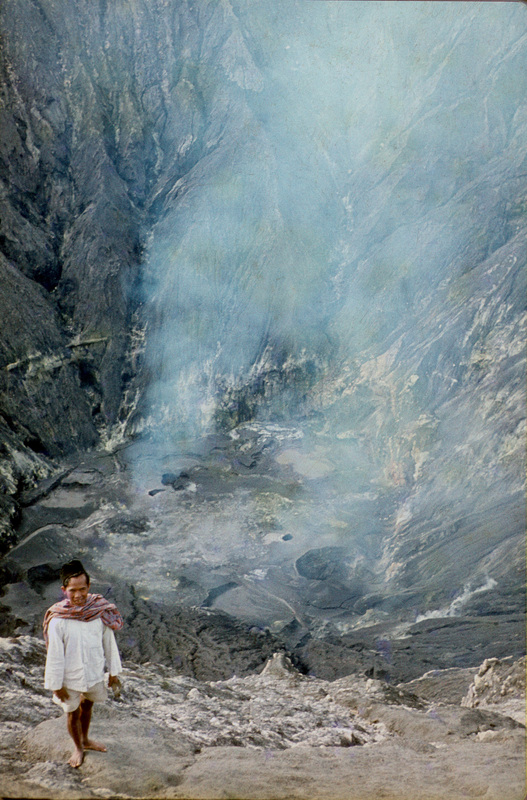 Bromo is probably the most popular volcano attraction in Indonesia. Situated in the middle of the “Sea of Sand” (lautan pasir), the ancient crater of the Tengger caldera, Bromo itself is only 2,329 metres high. The perfect ridged cone of Gunung Batok next to Bromo stands taller at 2,470m and the surrounding crater rim is higher in many places, with the highest peak being Gunung Pananjakan (2,782m, also spelt Penanjakan). It is from Pananjakan that thousands of people watch the sun rise with Bromo and Batok in the crater below, and Java’s highest peak Semeru brooding in the background. Gunung Pananjakan is not a Ribu because of the proximity of the much taller Gunung Semeru, but the spectacular view is well worth “Spesial” status – the Sea of Sand, the Hindu temple, the beautiful cone of Gunung Batok, gases rising from Bromo’s crater, and the menacing Semeru in the distance. The only problem is that you don’t have to earn the fantastic view – there is a road that leads from Sea of Sand up to within ten or twenty metres of the summit of Pananjakan, and most people take well organised trips by four-wheel drive jeeps or motorbikes for the sunrise. On a busy weekend the viewing points can be a circus, and there are usually hundreds of jeeps lining the road near the Pananjakan summit. However, there is a really pleasant way to hike and bag this special peak, avoiding the crowds until the last 15 minutes, especially if you approach Bromo from the Probolinggo route in. Most people stay in Cemoro Lawang (also spelt Cemara Lawang), which is is the closest village and literally perched on edge of the north side of Tengger crater rim (2,350m). Despite the number of people that pass though, Cemoro Lawang is a lovely place and the farmland of mostly cabbages and corn fields cover the slopes of the crater rim away to the north, and terraces reach up the steep sides of Pananjakan. There is good hostel accommodation here and also a camp ground with views directly of the Sea of Sand and Bromo. To earn the sunrise on Bromo, you start your hike at around 3:15 am from Cemoro Lawang, walking along the road that runs west along the rim edge (the road is the right turn about 50 metres before you get to the Bromo Tengger Semeru National Park entrance). You quickly leave the congregating jeeps behind; keep going straight along the crater edge, and in approximately 30 minutes the road begins to climb a little. At the end of the paved road continue straight on the path into shrubby forest. Even with a full moon, you will need a torch. The path is mostly paved, although a little overgrown, so make sure to follow the paved route as it zigzags upwards. After another 30 minutes you reach a large covered viewpoint, which will probably be deserted at 4:15 am, and likely sees few visitors because of the need to hike uphill for 30 minutes! With a strong moon, Bromo and its clouds of white gas will be visible, as well as the lights and sounds of the jeeps roaring across the Sea of Sand. The trail up to the summit of Pananjakan continues from here; leave the viewpoint and turn left, uphill, and follow the zigzag path that makes its way up the steep slope – the next viewpoint should be 45 mins hike, and as you approach it you will hear the crowds. If the hike took longer than planned, this is a good place to watch the sunrise, but otherwise continue on the trail for a few minutes before emerging onto the paved road lined with jeeps and motorbikes. Turn right, uphill, and pass all the parked vehicles for about 15 mins – the entrance to the Pananjakan summit viewpoint is on the right and very obvious – there are several warungs (stalls) selling souvenirs, tea/coffee, food, hats and gloves, and local barbecued corn. The summit can be packed, and it can be good to descend some steps to right and stand on the steep grassy slope for unimpeded views. From the summit, you can see the famous scene of Bromo, Batok and Semeru. After taking more photographs than you ever thought possible of Bromo, you can also see Gunung Argopuro and probably Gunung Raung to the east. Once you’re finished at the summit, return to the road where you can also see Gunung Arjuno and Gunung Welirang to the west and also Gunung Butak further southwest. Just north of Arjuno you might be able to see the relatively small Gunung Penanggungan. The route on the road with the motorbikes has many more great photo opportunities and you can take one of the many ojeks on offer (motorcycle taxi) – don’t forget to bargain! If you wisely choose to hike back and shun motorised transport, don’t miss the path on the left that brought you onto the road before dawn. The hike back the same way is very different in daylight, and there are numerous great photo opportunities – the views of the farmland on the rim as you descend are also wonderful. It is also essential tourism to walk down into the crater from Cemoro Lawang and across the Sea of Sand to Bromo, which is possible in same morning after a well-earned breakfast. At the foot of Bromo is the sacred Poten temple where every year at full moon on every 14th day of the Kasada Month the traditional Kasodo or Kasada ceremony is held. The Tengger people throw offerings into the crater to ask for a good harvest and for the healing of various ailments. Near the temple there are a few hundred steps to reach edge of Bromo and peer inside, and across to Batok and Pananjakan. If approaching from the Pasuruan route you can stay at one of the simple homestays in Tosari (1,700m) which is about 2.5 or 3 hours drive from Surabaya’s Juanda Airport. The advantage to this approach is that it is slightly closer to Juanda and slightly less touristy than Cemoro Lawang. Like many villages on the higher slopes of the Tengger region, the local people of Tosari are mostly Hindu, with a few Christians and Muslims living happily alongside them. You will see many small temples and shrines by the side of the road and it is easy to forget that you are not on a mountain road in Bali. Common vegetable produce here includes delicious local potatoes and onions. Have your homestay owner arrange ojeks or a jeep to pick you up at 4am (ojek price around Rp200-250,000 per motorbike in 2019 – remember to insist on a helmet!) and drive you the 40 minutes up the steep road leading through farmland and casuarina trees to Pananjakan. Remember sweaters/jumpers, jackets and even a woolly hat if you have one because at over 2,700m the viewpoint for sunrise is very cold by Indonesian standards. Less than ten minutes up the road from Tosari is the office where you will be asked to purchase an entry ticket before continuing up towards Pananjakan. Before Pananjakan is Bukit Cinta (Love Hill, 2,500m) which is usually clogged with jeeps and locals selling snacks and scarves at the weekend. This is the first of the major viewpoints on the edge of the caldera on the route up to Pananjakan. A few minutes beyond Bukit Cinta is Bukit Kedaloh (unfortunately recently renamed Kingkong Hill, around 2,700m) which is usually less crowded that both Bukit Cinta and Pananjakan and that is why these numerous viewpoints have come into existence. If you are not a fan of crowds, the best spot is actually between Kingkong and Pananjakan, at a small viewpoint called Bukit di Atas Awan (Hill Above the Clouds, 2,740m) just two minutes walk along a muddy trail opposite Mesjid Syariah Mandiri (the mosque). On weekends there will still be 50 or so people here – and sometimes local campers) but that is preferable to literally hundreds both further down and higher up, especially given that the view is almost identical but with a few pleasant cantigi tree branches that you can frame your photographs of Semeru in the distance with. Soon after sunrise, the hundreds of jeeps will be heading down to the Sea of Sand (laut pasir) below and this means a fair bit of congestion. You may wish to have a drink or snack in a warung first before following them. In April 2019, the steps up to Bromo crater rim were closed due to frequent eruptions so pay heed to whatever the latest rules are because they are usualy there to protect you. If you aren’t allowed to hike up the steps you can usually still get as far as the base of Gunung Batok and the important Hindu temple Luhur Poten which is less than one kilometre from the rim and the perfect place to take photos of the eruptions, the locals with horses and the many colourful jeeps whizzing by across the sand. If the Bromo staircase is closed, check in advance with your guide or ojek driver and he may be able to lead you up to the top of Gunung Batok, the iconic peak that most people at first mistake for Bromo, which takes around 1 hour to reach the summit of from the Hindu temple. Take suncream, hats and plenty of water with you and enjoy fantastic views of the similarly-ridged Gunung Widodaren (2,614m) to the west of Bromo. Some tours also include an excursion several kilometres out to the south to ‘savanna’ more recently ‘re-branded’ as the moronically-named Bukit Teletubbies (2,100m). Here there is a large, ghastly selfie sign which should never have been built in a protected area such as the Sea of Sand, plus a few locals dressed up in costumes as Teletubby characters. It is worth the diversion however, because the photo opportunities as you speed across the Sea of Sand are numerous and you really get a feel for the expansiveness and beauty of the magical Tengger caldera. You can be back down at a Tosari homestay (or in Cemoro Lawang on the Probolinggo route) in less than an hour. Bagging information by Andy Dean, updated by Dan Quinn (April 2019). Getting there: Easy to arrange from practically anywhere in East Java. The two main access routes are from Surabaya or Malang, which both have train stations and airports although Surabaya has a lot more flights and is by far the more popular starting point for a trip to Bromo. From Surabaya Airport to Bromo takes around 3 hours and a car with driver is around Rp600,000 (one-way). From Malang it takes a little less time to cover a shorter distance (via Tumpang) but the prices are similar and the road more windy. From Surabaya you can head to Bromo either via Pasuruan to Tosari or via Probolinggo to Ngadisari and Cemoro Lawang. Pasuruan and Probolinggo also have train stations with a couple of executive class trains (notably the twice-daily Mutiara Timur running between Surabaya Gubeng and Banyuwangi). Accommodation: There are numerous hotels in and near Cemoro Lawang (over 2,300m above sea level so rather cold at night) on the very edge of the outer Bromo caldera, but they tend to be a little overpriced (but are just minutes away from spectacular views). If taking the Pasuruan route in, you can stay a little further down (10km or so) in a more affordable, simple homestay at Tosari and arrange transport including ojeks to take you to Bromo the next morning. This is ideal if you want to bag Pananjakan at sunrise – the classic viewpoint and highest point all around (though very touristy – see below). You can even stay much further away, in the hot coastal towns of Probolinggo or Pasuruan, but if you want to see the sunrise from Pananjakan then you will need to get up at around 2.00am with transport already arranged! 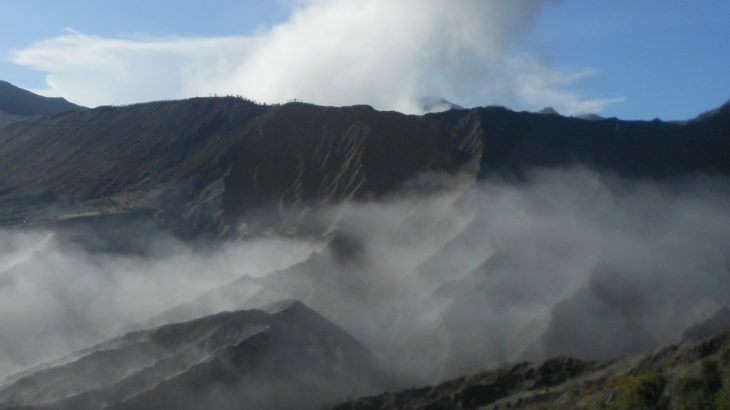 Permits: Buy a ticket on entry to the Bromo Tengger Semeru National Park area at the booths at Ngadisari or Tosari. Prices are highly discriminatory. In 2019, foreigners pay Rp217,500 per weekday or Rp320,000 at weekends and on national holidays. This includes KITAS holders who live and pay tax in Indonesia. Locals pay around a tenth of the foreigner price. This difference seems totally over the top and in most countries would be illegal. Water sources: There are many shops selling drinks and snacks nearby though ask for the price first as they are often sold at inflated prices. Gunung Batok = In Javanese, batok means “coconut shell“. The Tenggerese people believe that Mount Batok was formed from a coconut shell which was kicked by Resi Bima, a powerful giant, after failing to fulfill the conditions proposed by Rara Anteng to marry her. Featured, Jawa Timur Spesial. permalink. Had a very quick visit to Bromo this weekend. Perhaps it is my memory but I do not recall quite so many jeeps in previous years – there really ought to be a limit on the number as they clog the narrow road and cause unnecessary mayhem and noise in what ought to be a place of contemplation. Motorbikes are not much quieter, but at least you can weave your way between the many jeeps! We approached from Pasuruan for a change. Actually quite lucky to make our flight from Jakarta as Citilink cancelled the original one from Soekarno Hatta, stuck us on an earlier flight that was not convenient and then agreed to let us take the one from Halim at a similar time to our original booking. Well, it took 2 hours and 20 minutes to get from BSD to Halim. Bloody awful but thankfully the worst and most exhausting part of the trip – just getting to the damn airport! Trans Bromo sent a driver to pick us up at Juanda and he was ready and professional. We were up at Tosari in under 3 hours. Kayo homestay did the job, though the homestays are probably all quite similar. The best thing they did for us was arrange two ojeks for 4am the following morning, both of whom were superb. If you want a great ojek driver from the Tosari area who is friendly and knowledgable and versatile (can guide for Semeru too) then Setiawan is a super choice… send him a WhatsApp on +6282301020358. With the Park Authorities for Bromo Tengger Semeru it was a different matter. Naturally disappointed to have to pay ten times the local rate just because I’m not Indonesian (I paid Rp320,000 and my Indonesian friend paid Rp32,500), despite living and paying taxes here. Not much point continually repeating the statement that most Westerners regard equal treatment as very important primarily out of principle and are less likely to tip drivers etc when it seems every last coin is being extracted from them based on a questionable logic. Many will cancel plans if they feel exploited or avoid national parks altogether. I’m inclined to agree with them. Or I would be, if Bromo were not such a wonderful spot. We may not have had perfect weather but even when its a little cloudy the sunrise views are staggering. Javanese Edeweiss, cantigi trees in the foreground, the cone of Semeru in the distance, clouds lightly coating the lautan pasir below before the sun burned them off. We actually bagged Pananjakan before light and then avoided the crowds and scarf sellers by heading back down a few minutes to Bukit di Atas Awan to watch first light there. Checked at Pananjakan with my GPS as you often see the lower figure of 2753m given but the Bakosurtanal map height that we use of 2782m looks pretty accurate as the GPS reading was higher than that at around 2786m. Gunung Batok is already famous for being an iconic, weird volcanic cone, but neighbouring Gunung Widodaren is nearly as impressive, with those deep near-symmetrical ridge grooves. Beautiful. Our tour which started in Tosari at 4am included going out to Bukit Teletubbies, a word I can barely write or say without deep shame. That the authorities have built a huge selfie wall there in a protected area, perhaps using the money from charging foreigners ten times the price for admission, is difficult to believe. Who makes these decisions and what on earth were they thinking? Nature does not need these ‘Instagrammable additions’ – indeed, aside from the photogenic Hindu temple the whole point of this place and many others like it is the ABSENCE of human construction / destruction. In my mind there is nothing positive about a Bukit Teletubbies (spit) selfie wall and a lot of negative (arguably gross misuse of funds from entry ticket fees paid for by visitors). But it is not fashionable to listen to a white man complain in 2019, and so be it. Go ahead, build another one, or maybe a huge statue of King Kong at Bukit KingKong (not original name), or a massive selfie sign at the Bromo steps saying ‘I’VE VISITED BROMO’ that is taller than Bromo crater rim itself and indeed is more important to some people than Bromo crater which could be hidden somewhere behind the sign. I wouldn’t be surprised in the least. Or perhaps just build a Bromo sign down in Probolinggo and let people pretend they have visited by having their photo taken next to it (but paying the Park fees all the same). That way, they wouldn’t need the hassle of actually getting up the mountain. Anyway, I digress. Even with all the daft signs and discriminatory entry prices it is a brilliant place. This was my second experience of Bromo ash landing on me. The first time was a major eruption several years ago when I was the only tourist up at Cemoro Lawang, which was completed coated in the material. This time, light ashfall as we were being ojeked across the Sea of Sand near Batok. Don’t you have a KITAS? Then you pay local fees. Wrong. There was even a laminated A4 notice at the office saying exactly that. Disgusting treatment but as I have said before the majority of Indonesians have been brainwashed into thinking this is fine and bring out examples of similar discrimination in other SE Asian countries (e.g Thailand) as if to say that is must be OK because other nations also treat foreigners with contempt. Or just say ‘if you don’t like it, you go home Mister’, forgetting of course that if you are resident here then this country is your home. It’s sad how few Indonesians will defend the questioning of this, as if anything similar existed in the UK (.e.g Indonesians who live in London and pay tax there must pay 30 times the price to visit the Tower of London) then I would be the first to call it unacceptable. But folk here have generally not reached the point where they can accept any criticism. I’ll send you a photo of the A4 notice. I think bromo is nice but I didn’t like how everyone was taking the package tours and taking the vehicles. Yadnya Kasada Festival lasts 1 day. On the fourteenth day, the Tenggerese make the journey to Mount Bromo to make offerings of rice, fruits, vegetables, flowers and livestock to the mountain gods by throwing them into the volcano’s center. The origins of the event emerged in the 15th century after a princess named Roro Anteng started the principality of Tengger with her husband when the couple asked the mountain gods for help in bearing children. Legend says the gods granted them 24 children but only if the 25th was tossed into the volcano as a sacrifice. The 25th child, Kesuma, was finally sacrificed in this way after an initial refusal. The tradition of throwing sacrifices into the caldera to appease the mountain gods continues to this day. Climbed up the beautifully-shaped Gunung Batok last week. Brilliant weather and stunning views just after sunrise. Took an ojek down into the mist-covered sea of sand from Cemoro Lawang to the usual starting point for the hike up to the steps to Bromo itself (a mere 15 or 20 minute ride). My ojek guy, Joko, then led me up the side of Batok itself. As expected, this highlands villager was a super-fit hiker and left me panting almost as soon as we had started. Nevertheless it took just 30 minutes to reach the top, which is flattish and covered in the dark brown sand from its naughty neighbour. There is a small Hindu pillar on the Bromo side of the summit, and an empty Bintang bottle and some offerings of local potatoes were there too! At around 6am, the views were magnificent – including Semeru erupting and Arjuno-Welirang in the west and Argopuro in the distance to the east. The blanket of clouds covering the sea of sand slowly began to dissipate as we did a quick clockwise circuit of the summit area (the Pananjakan side appears to be a couple of metres higher than where the little monument is but I didn’t have my GPS with me to check). We had to retrace our steps before descending via the same route because there is a mini-ravine up there which is best avoided. All in all a great viewpoint and easy peak to bag for those who have already done the obvious Panajakan and Bromo. We were back at the hotel in Cemoro Lawang by 7.15. I bagged the Pananjakan/Bromo duo on Oct. 29-30. I took the train from Solo to Malang just to be close since I didn’t want to take the presumably interminable Bromo/Ijen/Bali trip from Yogyakarta/Solo that agencies there were offering. I contacted one of the three tour agencies listed in the Indonesia Lonely Planet guide under the Malang entry: Hotel Helios. I thought I lucked out that somebody answered my late Saturday evening call for a Monday tour start. Just like all the climbs and tours in Indonesia, this too started at midnight. I was starting to think that I’ll be perpetually sleepy over the entire duration of my holiday but the writing’s on the wall. Gotta get there by sunrise. Indonesian volcanoes apparently are early risers. I was picked up first so I got to ride shotgun. This would prove to be felicitous because, as it turns out, the Helios Hotel’s jeep was long overdue for maintenance and my seat was the only bearable position inside the jeep. I slept most of the way and when I woke up we were already traversing the Sea of Sand. I remember marveling at our driver’s keen sense of direction. I could not discern any road markers in the infinite darkness. We finally arrived at the Cemoro Indah hotel in Cemoro Lawang on the Tengger ridge. That was where we got our first glimpse of Batok and its brothers silhouetted in the moonlight. Just from those faint immense shadows in the distance I already knew that the morning would be breathtaking. It was only a short stop. Our driver then drove us the zigzagging road up the ridge to “meet our guide”. I never really knew what to expect. I was under the impression that we would just stay in Cemoro Lawang until the morning. Well, it turns out that my companions (an old French couple) were die-hard trekkers and they especially requested to hike to Pananjakan instead of being driven. This confused me as I thought we’d be climbing Bromo. But I had no other choice but to follow. Only a few minutes into the hike in the dark, first on ash then on a very dusty trail, did it dawn on me that we were walking up to the highest point on the ridge. Doh! It probably took about an hour to 1.5 hr. We were the first ones to arrive at the viewing platform under the cellphone towers. There was a bitter biting wind at 4 am. The volcanoes on the Tengger caldera emerging in the dawn light erased all memory of a long trek on a dusty trail. The platform soon filled up. I noticed that people were arriving in jeeps! Why weren’t we driven and why all that walking? Again, by special request of those darn Frenchies. I therefore “bagged” Pananjakan inadvertently without even asking for it. I could not forget the sight of Cemoro Lawang, perched on the edge of the ridge, with twinkling lights at dawn and with wraithlike fingers of mist hovering above it, as the horizon lights up, first with pink glimmers, then orange, then red and yellow. The walk back through the same trail was actually a vastly more pleasant experience than the hike up. First of all, that view is priceless. The planted terraced fields all around Pananjakan are also an awesome sight to behold. It was then time to drive to the crater. It was a gorgeous morning. It was a great feeling to stand finally a few hundred meters from Batok, when you were just looking at it from far above the ridge. I refused the horse ride that seemed to be the local cottage industry in those parts as this would’ve defeated the mountaineering experience, n’est-ce pas? But after about 30 minutes of trudging on hard-packed earth, and then on ash and pumice as the trail meandered up Bromo’s slope, I began to doubt my early decision to refuse that horse ride. Oh, I could be merrily riding on that saddle, sniggering at those fools who opted to walk instead of ride. Huh, wait a minute, I’m one of those fools! So back to more work. I have not come to a firm belief that Indonesian tourist attractions all demand sweat and toil. Be prepared to work a lot to reap the rewards. It’s not just a walk a few steps here, jump over a barrier there. Nope, Barry and Mary, be prepared to slog it. Ok, back to the hike. I finally reached the concrete steps for the final approach. But hang on, why are people so slow? Well, folks, it turns out that the steps are all covered with dust and ash, so the only viable way of progress is to slip and slide. More frickin’ work, I thought! So there I was finally on the Bromo ridge. Was it all worth that sweat? Of course it was. Quit kvetching and bellyaching, Marcus! When I was sufficiently rested I had the hairbrained idea of handing over my camera to the French guy. I then followed the ridge to the left for about 10 minutes until my mettle gave in. I walked about 300 meters to the left of the top of the stairs. I stopped and turned around since I was thinking: what the hell are you doing?! The trail was getting narrower and narrower and ending up in Bromo’s belly was a reluctant sacrifice was not on my agenda. That would’ve pissed me off enormously. I was glad though that the Frenchie took a picture of me as I was walking up Bromo’s ridge. So there. Two baggings in one morning. When is the Kasodo ceremony this year? I’m going to Java in Jan. 2013 and hope to catch it. When I was visited Bromo on July 2011, the stairs was covered by the ash so it’s hard to reach the crater so I need to crawl. After having tasted some of the ash from Bromo’s ongoing eruption (which has caused many flights to Bali to be cancelled) yesterday on my hike up to the top of Gunung Tarub – the highest peak of Lamongan – I decided I ought to check out Bromo closer up while in the area. I woke at 3am this morning and set off up to Cemoro Lawang – it takes just under 2 hours from Probolinggo. Beyond Sukapura I began to notice the ash collecting on the windscreen and we began to cough! When we finally reached the end of the road at Cemoro Lawang, on the edge of the Tengger crater rim overlooking Bromo itself, it sounded like light rain hitting the windows. Even with the windows and doors shut, very fine volcanic sand was finding its way into the vehicle so I had to cover my mouth and nose. There were occasional flashes of light from the crater itself – at present you can apparently see lava during the middle of the night if you get up there for 3am. At first light I ventured out – a very eerie scene indeed. There were no other ‘tourists’ about and the entire area was coated in about a centimetre of brown sand from the eruption for many miles around and it was raining ash particles. It was difficult to take photos – simple a case of covering your head and pressing the button on the camera and hoping for the best. Birds were hopping around dirty brown farm fields looking for food as very occasional motocyclists negotiated the treacherous dusty road. It was a desolate scene and the few villagers I saw were coughing as they swept the dust from front of their homes. I’ve never experienced anything like it – the closest would have to be a thin covering of snow in the UK with medium continuous ‘snowfall’. There was no sunrise to speak of and certainly no classic postcard panorama for anyone waiting on Pananjakan – the entire sky was simply filled with volcanic dust. Now and then, a bit of blue sky above was visible and allowed a limited panorama of Bromo ejecting vast amounts of material continuously. It was mostly inaudible (from just under 3km from the Bromo crater itself) but now and again sounds similar to gunfire and thunder were heard. Jeep tracks were visible on the Sea of Sand below but I didn’t see any vehicles down there this morning – perhaps the wind has changed from blowing to the east to blowing to the north-east. After an hour or so, we headed back down the road and took some more shots from near Wonokerto, where the huge plume of dark volcanic material was contrasted sharply with the bright blue sky above. I finally spotted another ‘tourist’ car heading the opposite direction. Back at the hotel I had a much needed mandi to get rid of the coating of sand on me. I’ll be uploading some of these photos from Cemoro Lawang in the next few days…. 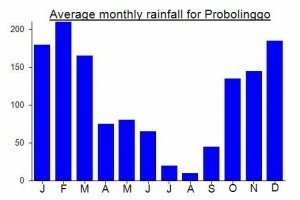 Bromo is on high alert…..
It’s been a pretty explosive year. Nice place for vacation to enjoy the atmosphere of the mountain. I Choose to take a Package Tour for Bromo Trip. with shuttle bus From jogja to bromo (it took 9 hours), hotel room for a night (plus breakfast), and jeep ride around Bromo. The Package only cost Rp.400.000.